JOLLY TROLLEY HOLIDAY LIGHTS TOURS for Private Groups! 2019 Available Dates ~ Every Evening/Night from Friday, November 29th thru Tuesday, December 31 2019! Do something extra-special with your friends and family, coworkers, or business clients this holiday season! 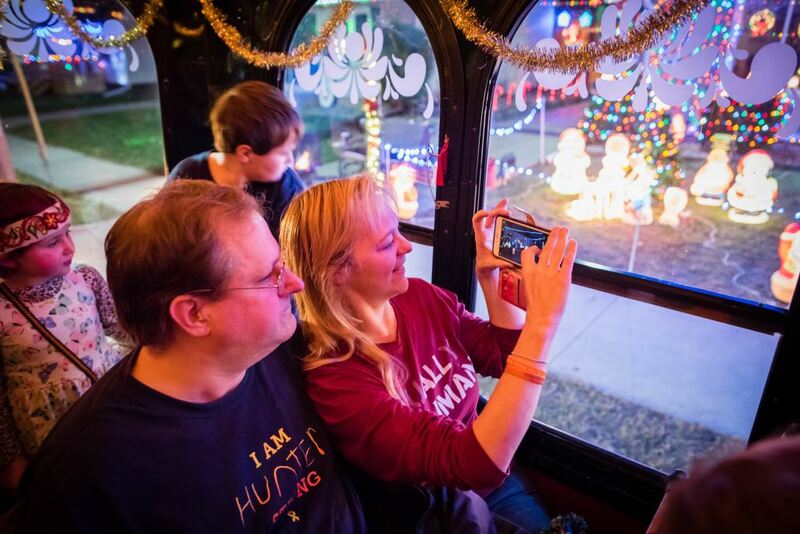 Jolly Trolley Holiday Lights Tours are entertaining option for family gatherings, holiday parties, business open houses, or for any type of group outing during the holidays! Experience some of Rochester’s most creative residential and civic lights displays! Enjoy classic holiday music aboard the warmth of a lighted, decorated, & HEATED trolley! 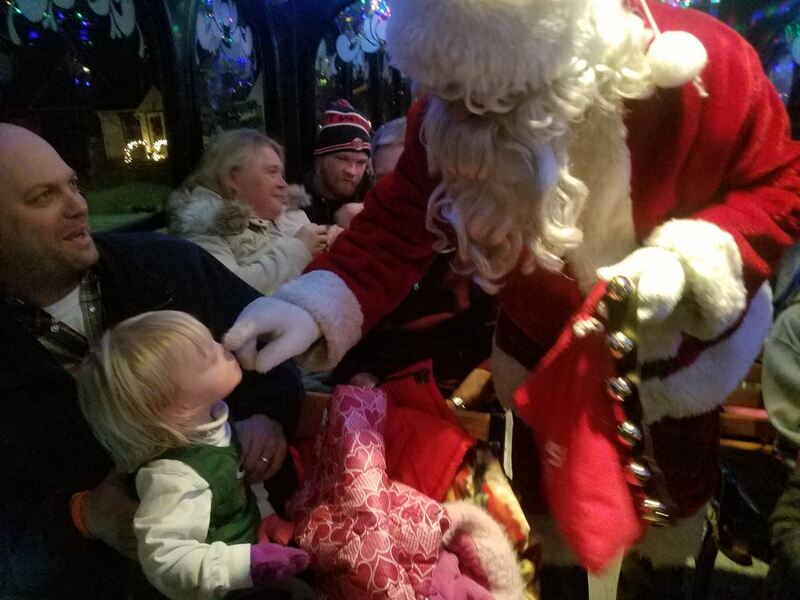 Now in its 9th Season the Jolly Trolley has become a Rochester Holiday Tradition! You choose which tour best suits your group and its special occasion! Jolly Trolley HIGHLIGHTS Tour ~ 2 hours! JOLLY TROLLEY HOLIDAY LIGHTS “HIGHLIGHTS” TOUR! Charter our MOST POPULAR private Jolly Trolley tour for your Group’s Holiday Party, Gathering, or Special Event! This tour is a great private holiday charter conducted at a relaxed pace for families, churches, businesses, client open houses, holiday parties and gatherings of any kind! Featuring the Best, Most-Lit Up, Elegant, & Creative of Rochester’s Residential & Civic Lights Displays! A true classic each Holiday Season, the HIGHLIGHTS tour combines Rochester’s NORTH and SOUTH residential areas into one tour that visits highlights such as: Santa’s Workshop, The Caroling House, The Spirit of Christmas, The Christmas Chevy, The Enchanted Forest, The Blue Christmas, The Frozen Tree, Winter Wonderland, The Christmas Court, Christmas Mountain, The North Pole, and Christmas on Pill Hill, among many others! 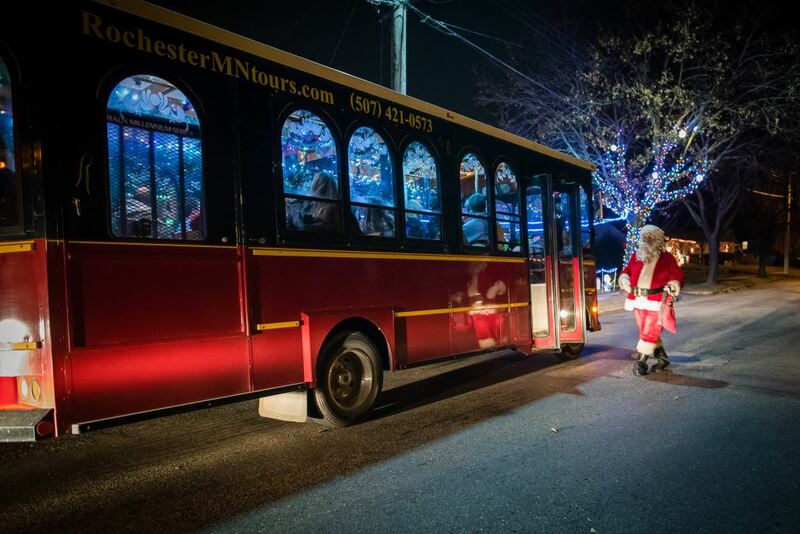 The highlights tour will visit SANTA’S WORKSHOP, where SANTA will board the trolley most nights, thru December 23rd! 2019 Available Dates ~ Every evening/night from Friday, 11.29.2019 thru Tuesday, 12.31.2019! Groups are welcome to bring food and beverages on the trolley! There can be a restroom break about half-way through the tour! On colder nights, we encourage you to dress warmly on your legs and feet and/or bring a lap blanket! Jolly Trolley HOLIDAY LIGHTS Tour ~ 60 to 90 minutes! JOLLY TROLLEY HOLIDAY LIGHTS TOURS! Do something extra-special with your friends and family, coworkers, or business clients this holiday season! Charter a Jolly Trolley for your Group’s Holiday Party, Gathering, or Special Event! Choose our original, now classic JOLLY TROLLEY HOLIDAY LIGHTS TOUR as an entertaining option for family gatherings, holiday parties, client open houses, or any type of private group outing during the holidays! Experience some of Rochester’s most creative lights displays and visit SANTA’S WORKSHOP where SANTA will board the trolley! You choose which area of the city you’d like to tour! Jolly Trolley “NORTH” Holiday Lights Tour ~ Features Fun, Creative, & Family-Oriented Residential Lights Displays of Rochester’s North Residential Neighborhoods! Great for kids, families, coworkers, business clients, and groups of any kind! Jolly Trolley “SOUTH” Holiday Lights Tour ~ Features the Classical Elegance & Old World Charm of Rochester’s South Residential Neighborhoods! Great for families, adults, friends, coworkers, business clients, and groups of any kind! Both NORTH & SOUTH tours have displays with appeal to both adults and kids alike! 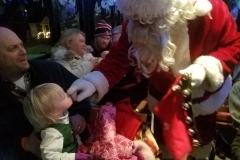 Both NORTH & SOUTH tours visit SANTA’S WORKSHOP, where SANTA will board the trolley most nights, thru December 23rd! Jolly Trolley KIDS SANTA & LIGHTS Tour ~ 60 minutes! JOLLY TROLLEY KIDS SANTA & LIGHTS TOUR! FOR FAMILIES OR GROUPS WITH YOUNG CHILDREN! 2019 Available Dates: Every evening/night from Friday November 29rd thru December 23rd 2019! Tours run a FUN & FESTIVE 60 minutes round-trip! Do something extra-special with the children in your life this holiday season! Designed for families with young children, ages 7 and under, our shortest lights tour of the evening is the perfect one-hour length for families or group’s with young children! Every Jolly Trolley Kids Tour visits SANTA’S WORKSHOP where SANTA will Board the Trolley! Before or after SANTA’S visit, we’ll tour some fun holiday lights displays in Rochester’s NORTH residential neighborhoods! Enjoy classic kids holiday music aboard the warmth of a lighted, decorated, and HEATED Trolley! 2019 Available Dates ~ Every evening/night from Friday 11.29.2019 through Monday 12.23.2019! Tours can start as early as 4:30pm, or anytime near dusk! Guests are welcome to bring their own snacks and beverages, such as hot chocolate or cider, on this tour!